All you need is a Kindle (any model since 2010) or another device that supports the Kindle Store such as an iPad, smartphone or an Android tablet. That together with an Amazon account is all that’s required. 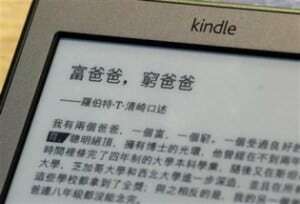 How can I download Kindle books in Chinese? Getting Chinese ebooks actually works in the same way as downloading Kindle books in English. You don’t need to live in China or Taiwan. Just access the Kindle store and find something you like! You can browse Chinese e-book titles here . At the time of writing, there are more than 1,000 titles you can buy from the Amazon.com Kindle store. Sure, it’s not a huge selection but this number should increase as time goes on. Most of the books we looked at on the Kindle store were in simplified Chinese, with traditional Chinese occasionally available too. Frustratingly, Amazon don’t currently have an official way of distinguishing between the two typesets so you have to check the book description to be sure. With each passing year, technology is transforming the nature of language learning as we know it. We certainly live in exciting times. So what are you waiting for? 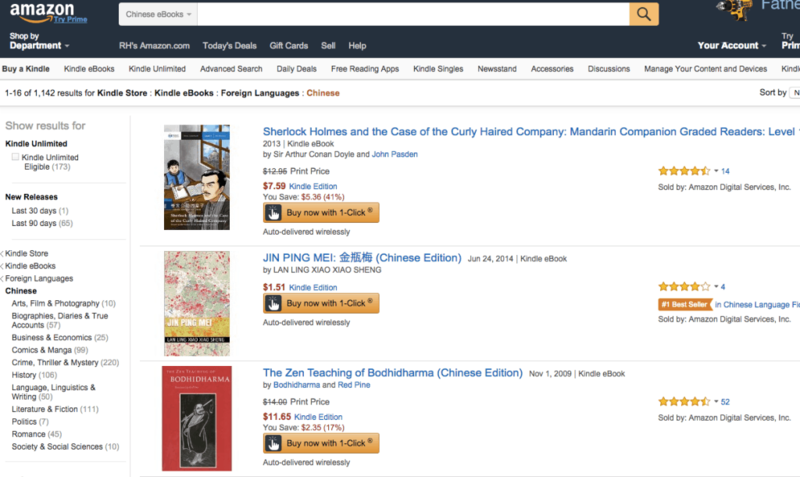 Check out the Chinese section of the Kindle Store now! Do you have any ebook recommendations? Feel free to write them in the comments below! Awesome post and even more awesome add-on!! I love pera-pera. Thank you!! Since you’ve managed to download content from Amazon.cn I would like to ask you how did you manage to register your Kindle with an Amazon.cn account, because I can’t. I have two different Amazon accounts, one for Spain and one for China with different emails. I own a Kindle 4th generation which has been deregistered from my Amazon.es account. However, when I try to register the Kindle in the Chinese account it tells me the account does not exist. Hi there Croquet. Thanks for your kind words. As for Amazon, the point of our post was that you can download many ebooks from the store of your home country (Spain in your case?). This depends on whether the publisher has chosen to release the content for the Kindle Store worldwide or just in the original country. So there shouldn’t be a need to register with Amazon.cn unless you prefer doing that. I currently download all of my ebooks from either Amazon.co.jp or Amazon.co.uk (I have two Kindles).